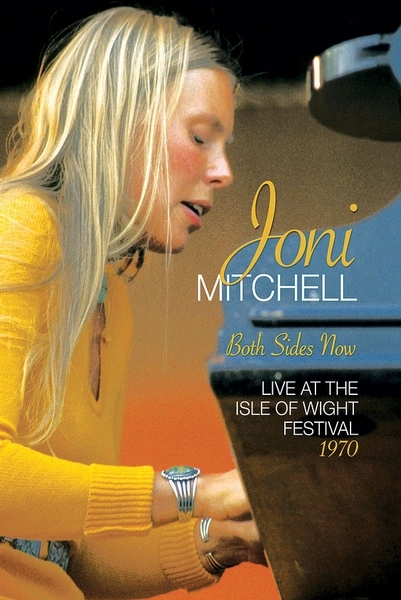 "A bit of a disaster" is how Joni Mitchell described an out-of-control August afternoon in 1970, when she gave a courageous performance at England's Isle of Wight Festival. Watching Both Sides Now: Live at the Isle of Wight Festival 1970, a new documentary by Oscar-winning director Murray Lerner, one sees how Mitchell tamed an agitated audience with a few fresh songs, a wide smile and a couple of astringent reprimands. At the end of only her third song, Mitchell became frustrated with the rowdy crowd. "It really puts me up tight and I forget the words and I get nervous," she pleaded. "It's really a drag, and so I don't know what to say. So just give me a little help, will you?" Her troubles began well before that. Mitchell was slated to play the festival at night, but organizers begged her to go on mid-afternoon against her better judgment. "I have a feminine cooperative streak," Mitchell recalls in the disc's supplementary interview. "So I said yes. And they fed me to the beast." It was surely the largest "beast" Mitchell had ever seen. On day four of the five-day festival, a crowd estimated at more than 600,000 squeezed into the ticketed, fenced-in grounds or camped for free on the adjacent hillside, waiting to see an illustrious lineup that included The Who, The Doors, Miles Davis, Sly and the Family Stone, Melanie and Ten Years After. The gulf between the haves and have-nots fueled much of the audience's frustration throughout the festival. While many thought the event should be totally free, others noted the conspicuous consumption of some of the performers. Mitchell notes that Neil Young rented a red Rolls-Royce and Donovan showed up in a Gypsy-styled caravan with beveled windows. It served double duty as Mitchell's dressing room. "The music isn't revolutionary at all," one disgruntled concert-goer said. "It's called big business." Mitchell, sheathed in a pumpkin-colored dress with turquoise jewelry and flowing blonde hair, might have chosen a more tactful opening salute. Staring out at the multitudes, she declared with a slight chuckle, "It looks like they're making Ben-Hur or something." She also might have switched around her set list. Beginning with "That Song About the Midway," a beautiful but delicate number, didn't exactly pump up the crowd. Instead, she might have started with the song she sang next, the up-tempo "Chelsea Morning." But she never finished it; halfway through, she stopped mid-phrase. "I don't feel like singing that song so very much," she said, abandoning her guitar. "Let me play you one at the piano." At that moment, it seemed Mitchell had psychically tapped into the downer wavelength of the crowd as she launched into "For Free," an earnest portrait of a street busker with the opening lines: "I slept last night in a good hotel / I went shopping today for jewels." The words may not have thrilled the hippies who groused about economic disparity. Mitchell's troubles kept mounting. As she introduced her fourth song, "Woodstock," a man in the front rows flipped out and needed medical attention. A producer took the stage to ask for a doctor. The disturbance, Mitchell said, rippled to the back of the crowd. But she forged ahead nervously, to meager applause. The song would become a signature tune, but at the time it was only the B-side of the single "Big Yellow Taxi," released four months earlier. Many in the audience were probably hearing it for the first time. During the song, Yogi Joe, an acquaintance of Mitchell's, somehow furtively made his way onto the stage. First, he quietly played a drum at Mitchell's feet; then he made a grab for the microphone before he was eventually dragged away. "We are uptight about commercial music co-opting our festival," he tried to explain as the camera followed him backstage. Listen a minute, will you? Will you listen a minute!? Now listen, a lot of people who get up here and sing, I know it's fun, you know, it's a lot of fun. It's fun for me, I get my feelings off through my music, but listen. You got your life wrapped up in it and it's very difficult to come out here and lay something down ... It's like last Sunday, I went to a Hopi ceremonial dance in the desert, and there were a lot of people there, and there were tourists. And there were tourists who were getting into it like Indians and Indians who were getting into it like tourists. And I think that you're acting like tourists, man. Give us some respect! Beginning with the next song, "California," another new one from Blue (an album which wouldn't be released for nearly a year), the crowd was quieter and Mitchell's performances became warmer, less dutiful. By the time she sang "Both Sides Now" and "Big Yellow Taxi," she was beaming - and the audience was on its feet in admiration. Joni Mitchell, at 26, turned an angry crowd around with bravery, willpower and a little tough love. It wouldn't be the last time in her career she would have to fight to be understood, by fans and detractors alike. This article has been viewed 882 times since being added on September 12, 2018.